The holidays are over but I still have a story to tell about our last Thanksgiving celebration. My daughter-in-law came up with the idea of having the ladies make new dishes out of our holiday leftovers. Nat made a delicious pasta dish out of leftover steamed broccoli ( Nat’s Broccoli and Pasta Remix ) and my daughter made a tasty dish using leftover roasted sweet potatoes and fresh kale. 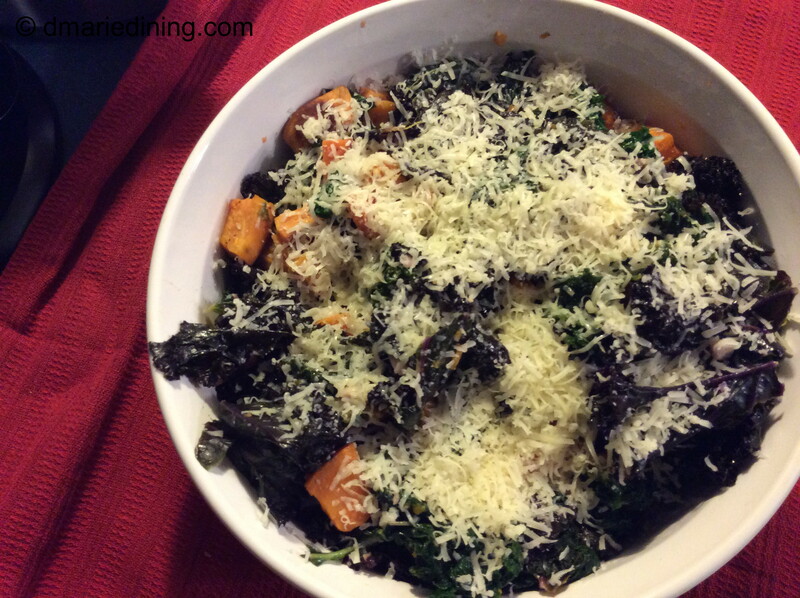 Baby Girl’s Kale and Sweet Potato Remix was pretty impressive and quite simple to prepare. Leftovers are great. At least in my book. I think the seasonings blending together overnight make some dishes taste even better the next day. That was true for the sweet potatoes we used for the Kale and Sweet Potato Remix. Of course using all fresh ingredients is fine too. You don’t have to wait until you have leftovers to make this yummy dish. If you need a recipe for leftover kale or sweet potatoes this is a wonderful recipe to pull together. 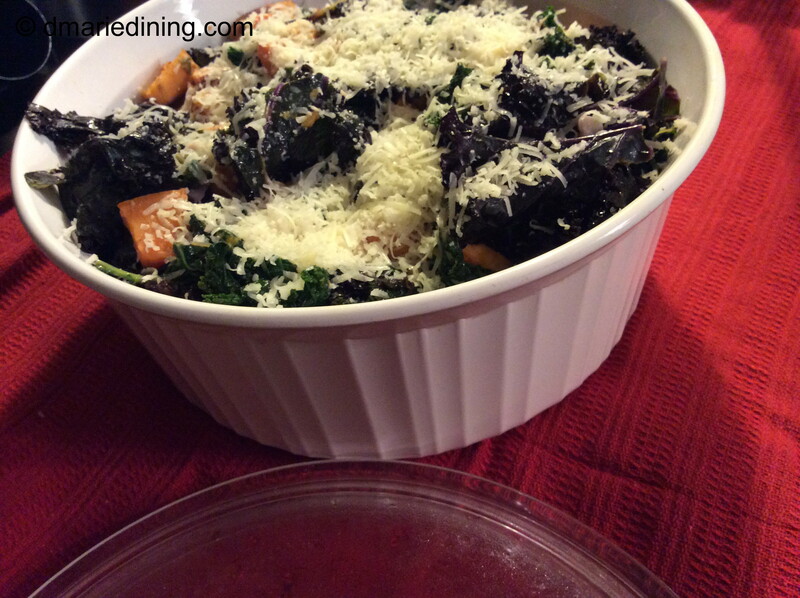 When Baby Girl thought of this recipe she decided to step it up a little by using two types of kale – red kale and curly green kale. I don’t remember ever seeing red kale in the grocery store or maybe I did see it but did not know it was kale. 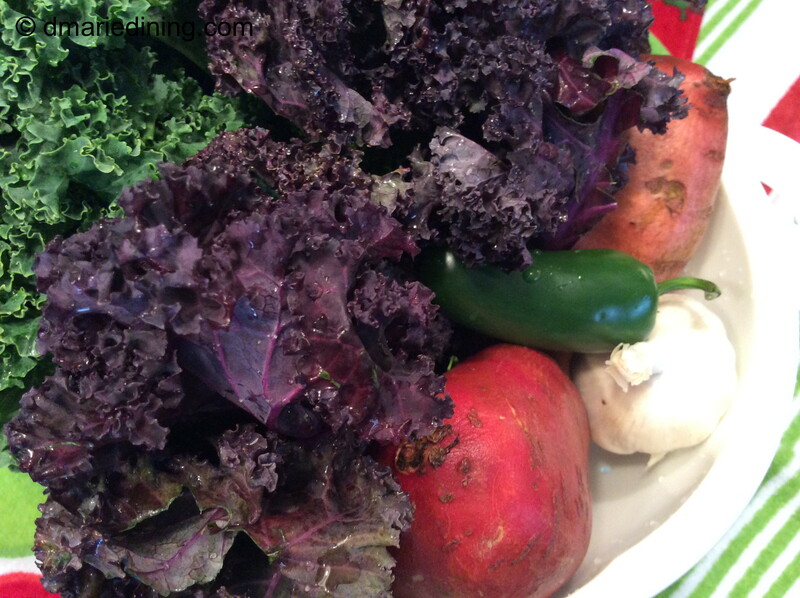 Anyway, the red kale was beautiful and had a sweeter and more delicate flavor than the curly green kale. The combination of the two types of kale created a nice balance between the slightly bitter and sweet flavors. Adding sweet potatoes only elevated the dish and made it blog worthy. Nice going kiddo! One more recipe to add to your repertoire and mine. Place cubed sweet potatoes on a greased cookie sheet. 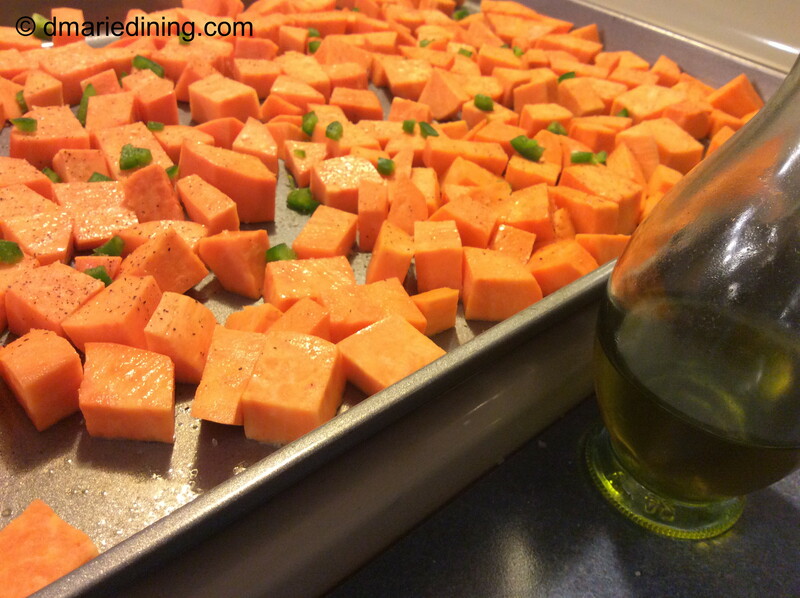 Drizzle olive oil over sweet potatoes. Sprinkle with jalapeno peppers, salt and pepper then toss to coat with olive oil. Place in oven and bake for 35 – 45 minutes until sweet potatoes are slightly browned and fork tender. Remove from oven and set aside. Heat 2 tbsp olive oil in a large frying pan over medium heat. Add garlic and stir constantly for 1 minute to prevent garlic from burning. Pour in white cooking wine and stir for an additional 2 minutes. Increase heat to medium high and add Redbor kale. 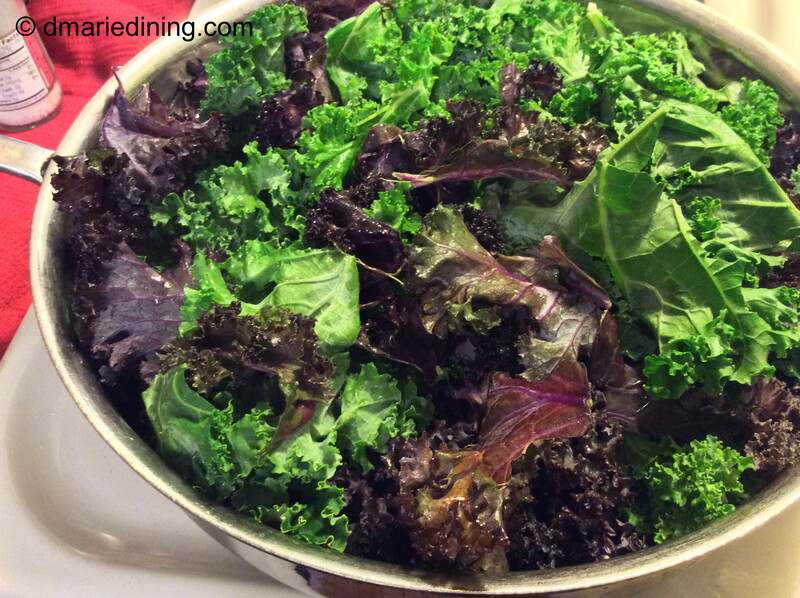 Cook for 6 – 8 minutes until the kale is wilted. Add the remaining kale. Season with salt and black pepper then cook for 15 – 20 more minutes until tender. Stir occasionally. Reduce heat to medium and add sweet potatoes to the kale. Gently toss to mix kale and sweet potatoes. Transfer to a serving dish. Top with grated parmesan cheese.